What is the maximum length that video cable can be run for CCTV cameras? 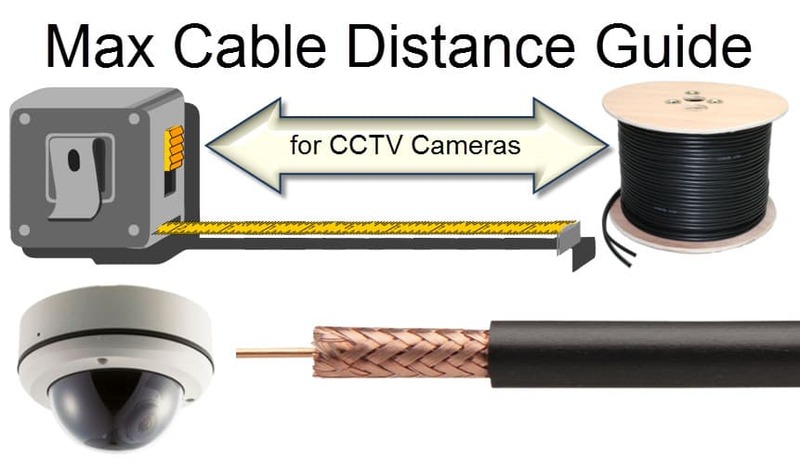 Most of the time, when someone asks this question they are asking what is the maximum distances that RG59 coax cable can be run for CCTV cameras or HD over coax security cameras (HD CCTV). However, there are a number of different cable options for CCTV and there are also other types of video surveillance cameras that are sometimes referred to as “CCTV cameras”. This guide will answer most common questions related to how far different types of cables can be used with various types of coax cable hard wired security cameras. RG-59 coax cable is by far the most common type of cable used in analog CCTV camera installations. However, it is not the only choice. Thicker gauge RG-6 is used quite often and it carries CCTV video signal a few hundred feet further than RG59. It is important to note that not all RG59 coax cable is created equal. Installers should use RG59 with a 100% pure copper center conductor and at least 95% braided copper shield. RG59 that is used for cable TV installations should be avoided. RG59 for CATV typically uses clad center conductor, which is a copper-coated steel, and aluminum shield (instead of copper braiding). RG59 Siamese cable is the most popular type of cable for CCTV installation because it conveniently runs both video and camera power. Here is a guide that shows that max distances these cable options can be used to run video from analog CCTV cameras to DVRs and / or monitors. In addition to coaxial cable, UTP cable (such as CAT-5), can be used with video baluns to wire CCTV cameras. This is handy at installation locations where CAT-5 cable has already been run to the required locations. CAT-5 with video baluns also allows longer cable runs, especially when used with active / powered video baluns. Another way to run CCTV video longer distances is by using CCTV video amplifiers with RG59 coax cable. HD over coax security cameras use the same RG59 Siamese cable as traditional analog CCTV cameras but support much higher video resolution. 1080p resolution video and beyond is supported. AHD, HD-TVI, HDCVI, and HD-SDI are all types of HD-over-Coax security cameras. HD CCTV cameras can use the same type of cables as traditional CCTV cameras, however, the video resolution is much higher. 720p and 1080p high definition AHD cameras are available. You can learn more about AHD CCTV here. Like CCTV, there are video baluns and coax cable video amplifiers available for AHD security cameras. Here is a guide that shows the max cable distances cable can be run to AHD cameras. RG-59 coax cable with HD video amplifier: 800 meters / 2600 feet. Multiple amps can be used together to extend over 5000 feet. TVI cameras are capable of 1080p video resolution. Just like AHD, HD-TVI cameras are hard wired to DVRs using coax cable such as RG59. TVI cameras can be run even farther that AHD cameras with RG59 coax cable. You can learn more about TVI cameras in this article: “what is HD-TVI?”. RG59 coax cable with HD-TVI video amplifier: 600 meters / 2000 feet. Multiple amps can be used to extend over 4000 feet. HDCVI cameras use another HD over coax video standard that is popular. These cameras also use RG59 Siamese coax cable. The distance that video cable can be run for HDCVI cameras is the same as AHD cameras. RG-59 coax cable with HDCVI video amplifier: 800 meters / 2600 feet. Multiple amps can be used together to extend over 5000 feet. HD-SDI security cameras are another high definition technology used in video surveillance applications. This is the same video standard used in HDTV so it has been around a long time. It also supports 720p / 1080p video resolutions but unfortunately cable lengths must be kept short. RG59 or RG6 coax cable must be used for HD-SDI cameras. HD-SDI does not support CAT-5 and video baluns. The only way to extent the cable distance is to use powered HD-SDI video repeaters. Here is a guide that shows the max cable distances for HD-SDI cameras. Here are some resources related to security camera system installation. I hope that this guide was helpful/ If you have any questions related to security camera installation, please email me at mike@cctvcamerapros.net.